Dan Kneen with Mar-Train Racing team owner Tim Martin. Manx rider Dan Kneen has signed for Northern Ireland’s Mar-Train Racing team for 2016. Kneen takes over the ride from Dean Harrison, who was released from his two-year contract with Tim Martin’s Yamaha outfit after a mixed season on the all-new YZF-R1 Superbike. The 28-year-old will lead the charge for the official Yamaha UK road racing team at the North West 200, Isle of Man TT and Ulster Grand Prix and is also set to contest ‘selected events’ due to be confirmed at a later date. Kneen, who rode for Clive Padgett’s Honda team this year after winning the Ulster and Irish Superbike titles in his debut season of Irish National road racing in 2014, proved his class with a maiden international success at Dundrod last year, when the Braddan man defeated Harrison to win a thrilling Superstock race on John Burrows’ Suzuki. He became the first newcomer to win three races in a week at the Manx Grand Prix in 2008 and has claimed 12 top ten finishes at the Isle of Man TT, including an excellent fifth place in the second Supersport race in 2010. “I just wish it was the beginning of the season now,” said Kneen, who will ride the R1 Superbike and Superstock machines and a YZF-R6 in the Supersport class. “I’ve spoken to Tim before but the time is right now and hopefully it will be a perfect match for us. “The bikes are definitely good enough for the job. I had my best ever TT result on an R6 Yamaha and the R1 is only going to get better and better. I get on really well with the guys in the team as well,” he added. “I met up with Andy Jamison last week and we seem to be on the same wavelength, which is really positive. Martin’s Lisburn-based Mar-Train Racing concern is entering into its second year of development with the R1 Superbike and the confident team owner is convinced Kneen is the right man to showcase the true potential of the machine in 2016. “We are a million miles from where we started 2015 with the YZF-R1M,” Martin said. “The improvements were evident at the Gold Cup [when Harrison won the feature race] and we have been working with Yamaha UK in the off season to ensure we have an even stronger package for 2016. “I am excited about our prospects for this year; we needed to ensure we had a hungry young rider capable of delivering the potential of our bikes and I am really pleased we have managed to secure that in Dan,” he added. 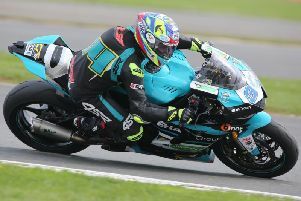 “He has won at the Ulster Grand Prix, lapped the TT at 130mph last year and was running top sixes before mechanical issues at the North West 200, so he is perfectly capable of challenging for international honours with us. Karl Radley, Motorsport Co-ordinator for Yamaha UK, said he expected Kneen to be ‘a force to be reckoned with’ next year. “Yamaha are really pleased to welcome Dan on board with Mar-Train Racing,” he said. “He’s clearly a talented rider and with the new R1 underneath him the Manxman will be a force to be reckoned with on his home turf as well as the NW200 and Ulster Grand Prix.